But we do our level best. to keep you all connected and in touch. But we don’t complain; well, not very much. It’s an honour, not a job, so do you see. That her majesty’s the boss, the best boss ever been. On that all God’s Poor Orphans will agree. We’ll convey them good or bad. We did it for honour not for a few bob. We’ll end our service with a contented sigh. And depart for that great Telephone Exchange in the sky. It would be nice if this were a website about railway architecture, but it isn’t. If it was I could wax lyrical about the amazing railway viaduct on the “Heart of Wales” railway line near Cynghordy, Carmarthenshire. This truly is a masterpiece of Victorian railway engineering. Or I could prattle on about the fantastic line itself which meanders through some of Wales’ finest scenery on it’s four hour journey from Shrewsbury to Swansea. There’s another on the line at Knucklas near Knighton. I was actually there on a dual hill-walk/house hunting mission when I saw this unusual arms-wood-less telegraph pole which I thought I would share with you dear listener. 1. 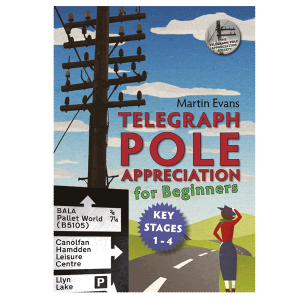 Did anyone ever answer the question about the lifespan of a telegraph pole? 3. Are they required to be inspected / tested annually (or at another period)? 4. Does anyone know the breakdown of the codes affixed to a pole? We put these questions to our Honorary Technical Advisor Keith S**** at his secret lair somewhere in the UK. And as always, despite his being Britain’s top telegraph pole spook, he went above and beyond the call of duty to answer a needy listener. The life span of a properly creosoted pole is infinite, if it were kept in ideal conditions it would last forever, however, when ‘planted’ it is subject to the rigours of the environment. Rot (decay) is the only enemy of the pole apart from impact from heavy objects (like cars). Rot in timber requires three factors, oxygen, moisture and the spores of a fungus. These are, in poles, usually only found at the ground line and it is here a pole will decay. There is not to my knowledge any statutory requirement to replace poles at a specified time. Poles are,or were in my time, tested on a regular basis by engineers dedicated to this task who would take a sample boring from the pole at a point remote from the ground line, (there was a scurrilous rumour at one time that they just whacked them with a heavy hammer) ie a pointless exercise. Occasionly one would come across a pole with decay at the tip caused by the pooling of water there. Light and Medium (and stout of which there were very few) referred to the diameter of the pole. Heavier poles were needed to carry more wires. Also ‘cut in’ was the year of processing eg 79 would be 1979. Other marks (Cutting in) on the pole varied at different times. There’s only thing WORSE than being talked about…. and that’s NOT being talked about. One’s vanity forces one to Google one’s self – approximately every 20 minutes. The above chatter discovered on Football discussion forum, Red-Passion. Best ‘non-pornographic’ website – what an accolade! I can’t believe I’ve come to this. Scrabbling down roadside embankments to retrieve bits of smashed telegraph pole following a tip-off from another website. This obsession all started last year when a lazy BT engineer lobbed an old one into my hedge, which I subsequently restored. Since then I’ve been rescuing bits and pieces from all over the country. Including the odd ceramic insulator sent to me in the post. I have a cunning plan for those but cannot reveal anything at all just yet. All of which has caused my poor dear wife to come down with a severe bout of tutting-eye-roll syndrome. Anyway, this is one of those lovely antique four-arms that still stand (stood) along the B5105 between Ruthin and Cerrigydrudion in Denbighshire. And which fortunately, quite recently, I photographed the lot. it’s unlikely that the offending vehicle is still in a singular number of pieces following such a smash, but there was no sign of it by the time I got there. Anyway, with my missus “keeping nicks” I attempted a swift recovery. However the ceramics were so badly corroded to their stalks that i couldn’t remove them. But 2 of the arms were shattered and separate from the rest, so for now I retrieved these. I managed to recover 3 x single grooves and 2 x double grooved white ceramics to add to my burgeoning collection. Alas the wood was beyond economical repair and has been added to the logpile. I was later to be found sat in our yard scrubbing them back to some fantasised about former-glory. I know that our Honorary Technical Advisor, Keith S**** H.T.A.T.P.A.S. will be pleased because he just wrote and said so. Is it a pole? or is it a pylon? These massive structures support the weight of all the electricity generated by Cefn Croes Windfarm as it crosses the lower slopes of Pumlumon (eng: Plynlimon) in mid Wales. On this particular day (9th April) they had absolutely nothing to do as there wasn’t a single breath of wind. Not even atop the mountain itself at 2,467ft (752m). Rarely have I been so high and experienced so little wind. So, in an attempt to alleviate their intense boredom, these biploar poles, near Eisteddfa Gurig farm, took to fishing for clouds. And I was amazed to see this one catch a gorgeous little cumulus humilis as we passed underneath. It hung onto it for a short while, only to let it go back into the wild again whereafter the cloud shortly evaporated. I first encountered these cards in a shop in Llandeilo,Carmarthenshire, wherein I promptly brought the lot. They are the creation of Jacky Al-Samarraie of www.theartrooms.co.uk who clearly understands the aesthetics of the rural telegraph pole. My vested interest notwithstanding, these bold cards seem to capture, exquisitely, the essence of our British countryside. Jacky tells me that of all the cards she has designed, those with telegraph poles are her favourites. Why wouldn’t they be? For more cards and even more with telegraph poles on them visit The Art Rooms website. What’s so special about this pole? you might say. And a photo taken amid leafless trees on a dull grey day. But they don’t have to be spectacular to feature in my pole-of-the-month spot. They just need to catch my eye. For starters, this one, at Pwllglas near Ruthin, is an orphan – there are no longer any telephone wires attached to it. The business end of it, as well as having 5 cross-arms, some double-sided – has an eclectic mix of ceramic insulators. There are “pot-heads”, “double grooves” and in varying shades and of various antiquity. And then there’s a couple of extra potheads on a mini-arm at the top. Clearly this pole has been busy at one time. And then look at the bottom. If they were ever to remove this pole (heaven forfend) then it would leave a perplexing gap in the wall. Firstly, our Honorary Technical Advisor Keith S**** H.T.A. T.P.A.S. (pictured left, yesterday), has written in answer to Paul’s request for information a good few posts ago. Have just seen Paul’s heart rending message,he is obviously worried that his poles may fall over. Do not fret my dear chap, properly pressure creosoted poles will last up to 100 years, yes 100 years before they fall down.Trust this alleviates your anxiety. He’s also written again to correct this website on some potential inaccuracies – well, that’s what Honorary Technical Advisors are for after all. In my Hieroglyphics gallery I make mention of “Heavy” poles. Apparently, no so thing; they are light, medium or Stout as indicated by the “cutting in (gouging). Last gouged figures on a pole indicates its year of processing. “Mind you”, he says, “the stouts would be pretty heavy”. Finally, and it was never my intention to collect telegraph pole insulators or indeed photos of them. But that is what seems to be happening. And Ray Thorp – ex GPO / Post Office Telephones / British Telecom employee of 42 years sent me some photos of his eclectic potting-shed based collection. Among his ageing exhibits are an ex-Southern Railway insulator made of pitch-fibre. And the central one pictured right dates back to the National Telephone Co. and while porcelain on the inside is made of enamelled tin on the outside – like a camping mug. Stay tuned listeners… All photos gratefully received – ceramics, pole of the month contenders, bizarre stuff. Telecom Eireann engineers have come up with a novel way of getting around the budget cuts within the Irish GPO – simply don’t bother with the lower half of their telegraph poles. No hole to dig, only half the wood used and technically no need to pay the wayleave ground rent either. This photo taken along the R181 somewhere near Castleblayney in central Ireland. Part of me says I should have saved this photo for April.